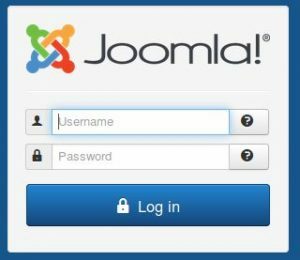 In my last article I mentioned why one might choose Joomla for building a web site. 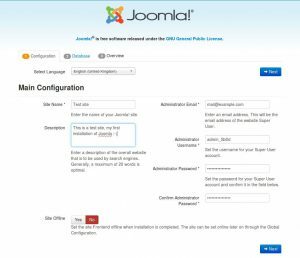 In this description you will see, how you can manually install a fresh new Joomla CMS on your web server. 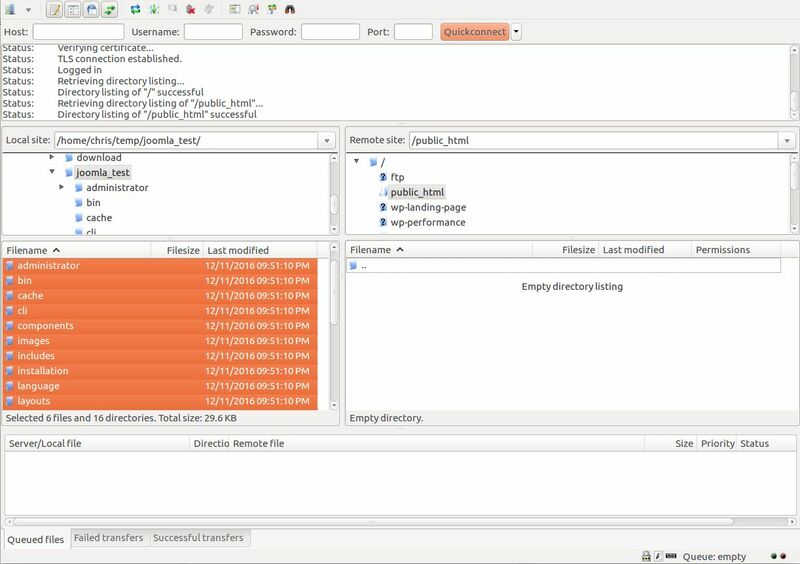 Unzip the installation files. 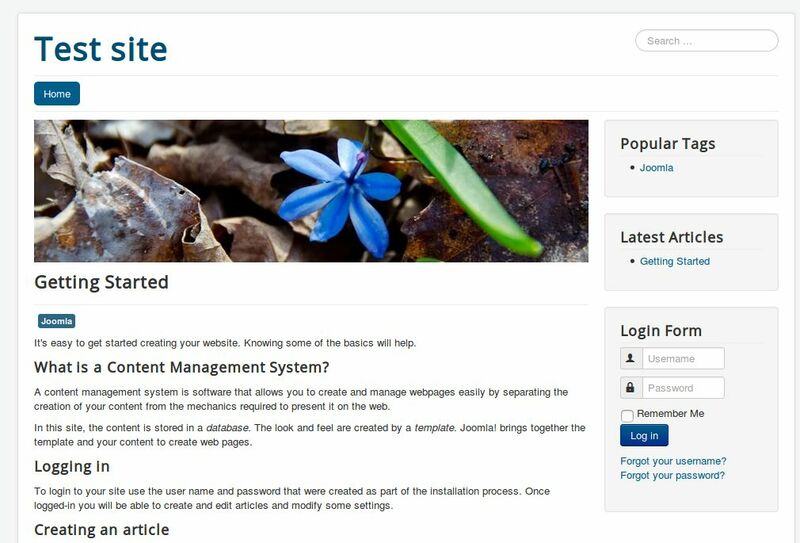 In my case the file is named Joomla_3.6.5-Stable-Full_Package.zip. The are currently 5336 files in this release 5336 which cover 52 Megabyte. Of course, this will vary depending on the version. Upload unziped files to the server/hoster of your choice. In my case I uploaded all the files to /public_html. Please check what is the name of the right directory. Different hoster may use different names. Select all the files and upload them. With Filezilla you might use the right mouse button and choose upload. Depending on the speed of your internet, this may last a few minutes. Please refer to your hoster how this can be done. 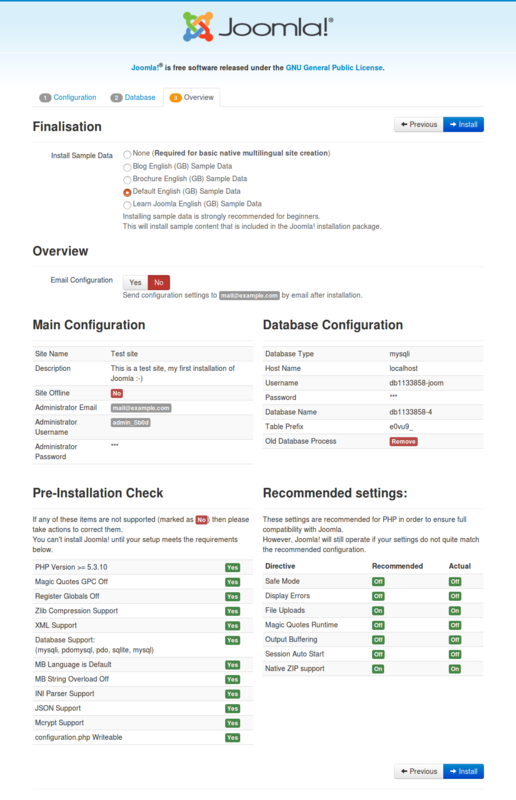 Possibly you can do that in your cpanel or Plesk tool. You need a new database and a user which has all the privileges. For security reason please choose a secure password. Password should not be found in any dictionary. If it is, it can be used in a dictionary attack. Use the password for only one account or one purpose. Do not reuse passwords. If the password is used several times and is compromised, other accounts can easily taken over. I suggest using a Password Safe like KeyPassX. 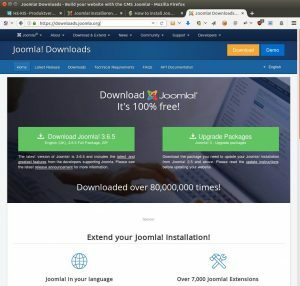 If you have Joomla installed in a subdirectory (local install) you should adapt the URL. 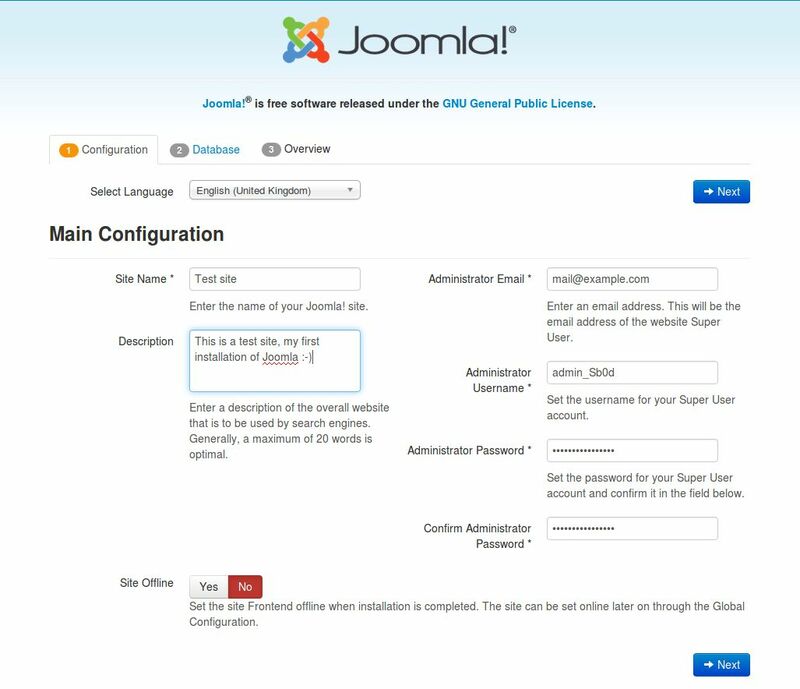 You will see the Joomla installer, where you can enter some administrative input. Site Name: Here you can define how your site should be named. A lot of templates use that as a heading. This can be changed afterwards. Description: Add a brief description. Depending on your template this may appear at different places. This is a alternative meta description. Best is to use 20 to 25 words. This can also be changed afterwards. Admin E-Mail: This email will be used in cases of system messages and password recovery. Should be valid, of course. Admin Username: This is the user name of the admin account. Default is admin, which should be changed. As you recognized my admin name is not easily guessable: it is admin and 4 random characters. This helps preventing script kiddies from brute force the admin account. Admin Password: A secure password, see above. If you are done, you can choose NEXT. In the next tab you have to configure the database. 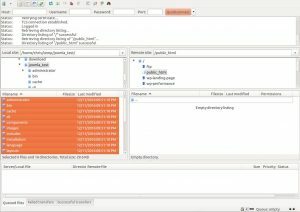 You can enter the necessary information of your MySQL database. Host Name: mostly localhost, but contact the support of your hoster if you have troubles in deciding. 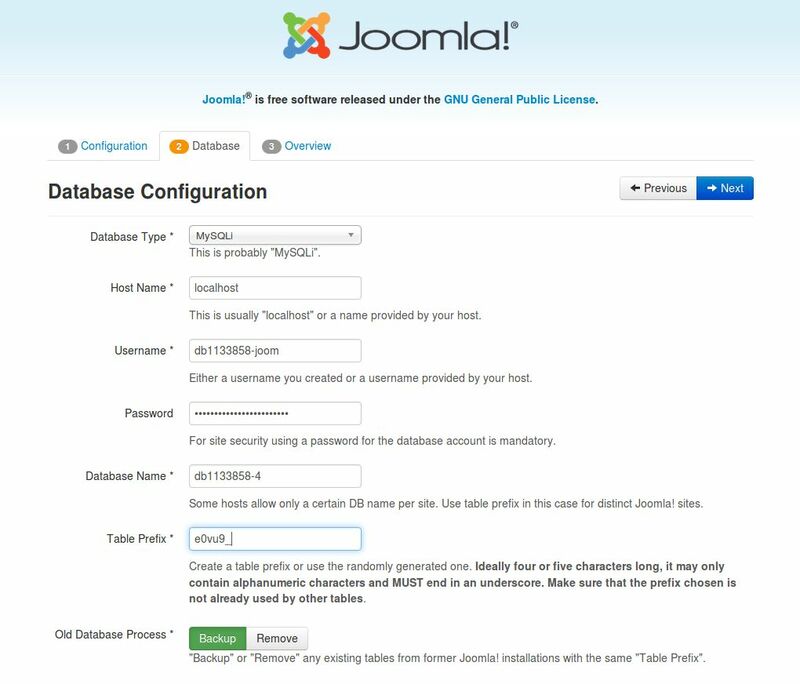 Table Prefix: There is a prefix, so you could install more Joomla sites in one database. You can leave this value. 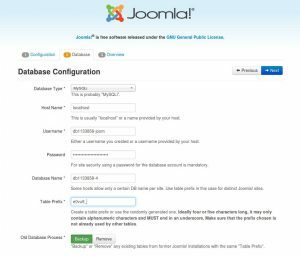 After that, there is the possibility of backing up any existing data from an old Joomla installation. If there is one please do by clicking Backup, otherwise choose Remove. Now you can press Next and you are almost done. On the last page you can choose if you want some sample files which should be copied to your installation. For a beginner, this is very neat. You can plunge around in the files and see how things can be done. So Default English (GB) Sample Date is quite well. Further more the is a summary about what you have chosen for the installation. Have a look at these and correct if some is wrong. 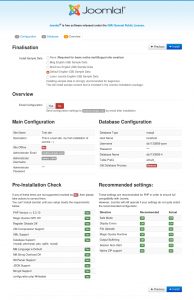 After that you will be shown a summary of the configuration. If all seems well you will get a green Yes at every line. You can now hit the Install button and everything should be done in a few minutes. There is one last thing to do. Please remove the installation folder. This is required for security. 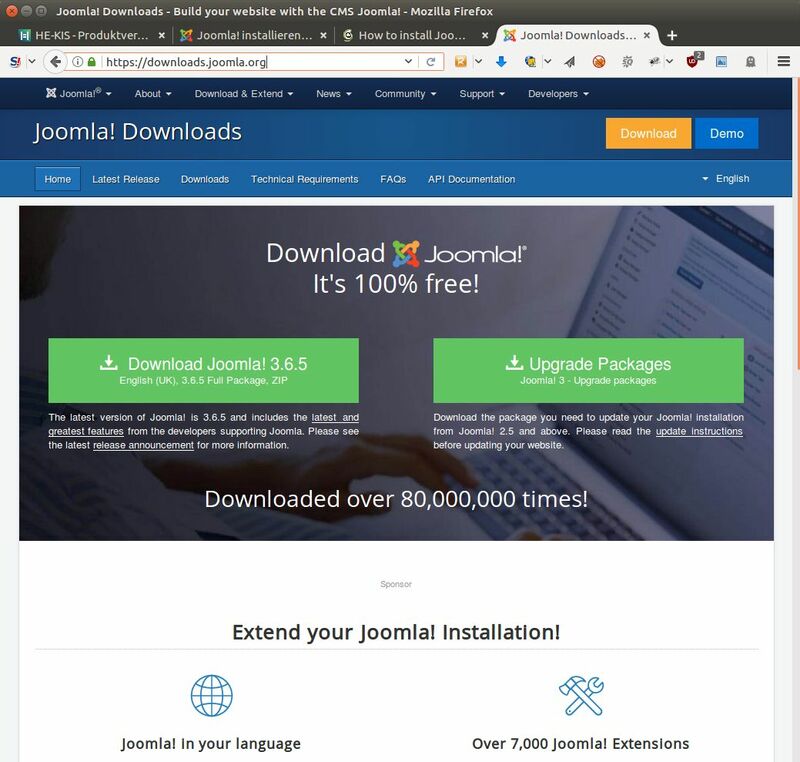 If you do not, anyone could reinstall Joomla and destroy your site. If you do not remove the installation files, you can’t process any further. 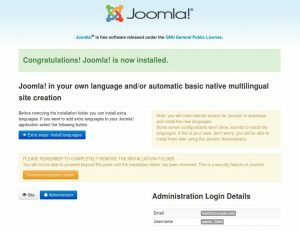 This is prevented by Joomla itself. 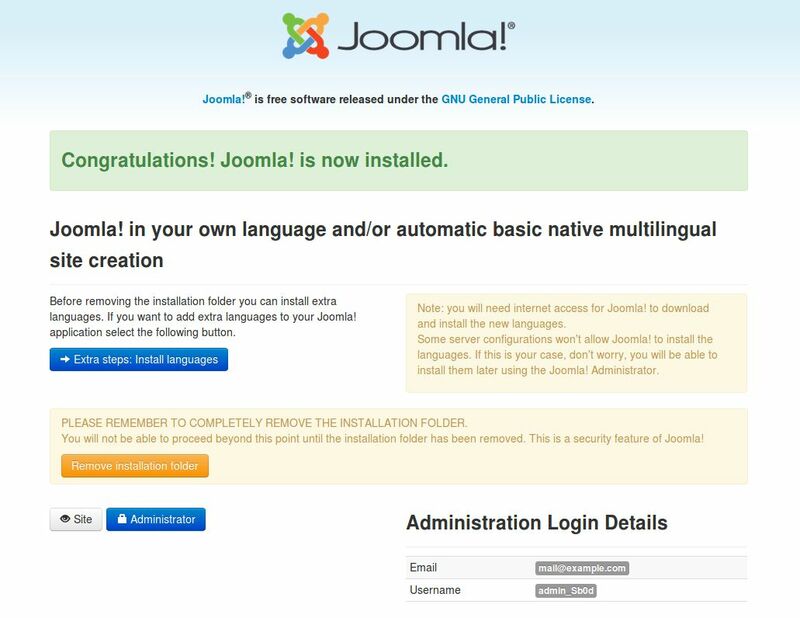 Congrats, you have installed your first Joomla CMS System. 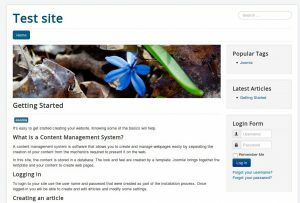 Now you can start publishing. What’s up, all is going perfectly here and ofcourse every one is sharing facts, that’s truly fine, keep up writing. It is not my first time to visit this web site, i am visiting this site dailly and obtain nice information from here every day. What’s Taking place i am new to this, I stumbled upon this I’ve found It positively helpful and it has aided me out loads. I’m hoping to give a contribution & help different users like its aided me. Good job. Aw, this was an extremely good post. Spending some time and actual effort to create a great article… but what can I say… I procrastinate a whole lot and never manage to get anything done. Hello, all the time i used to check weblog posts here early in the break of day, for the reason that i enjoy to find out more and more. Hi there, I discovered your blog by way of Google whilst searching for a comparable subject, your web site came up, it seems to be good. I have bookmarked it in my google bookmarks. I think the admin of this web site is truly working hard in favor of his web site, for the reason that here every data is quality based material. Great post. I used to be checking constantly this blog and I’m impressed! Extremely helpful information specially the closing section 🙂 I handle such information much. I was seeking this certain information for a long time. Thank you and good luck. I blog often and I seriously thank you for your information. This article has truly peaked my interest. It’s amazing to visit this website and reading the views of all colleagues concerning this paragraph, while I am also eager of getting know-how. Awesaome issues here. I’m very happy to see your article. will send this post to him. Pretty sure he will have a great read. yοu shared this useful information with us. Pleaѕe stay us informed like tһis. Thanks for sharing.